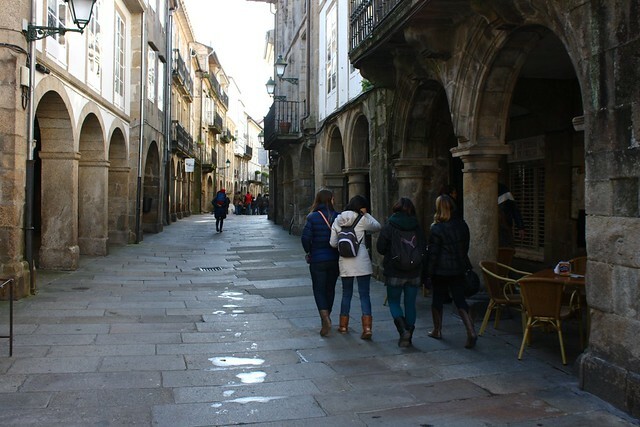 Santiago de Compostela is a real crowd-pleaser. My family came to Spain to visit me for the holidays this December, flying into Madrid before all of us hopped on the train up to Segovia and Santiago for two nights each before returning to the capital for New Year’s Eve. Last school year I had two American friends I met in Jaén province down south stay with me while we explored Galicia, and I’m expecting at least two more friends to visit Santiago this spring. 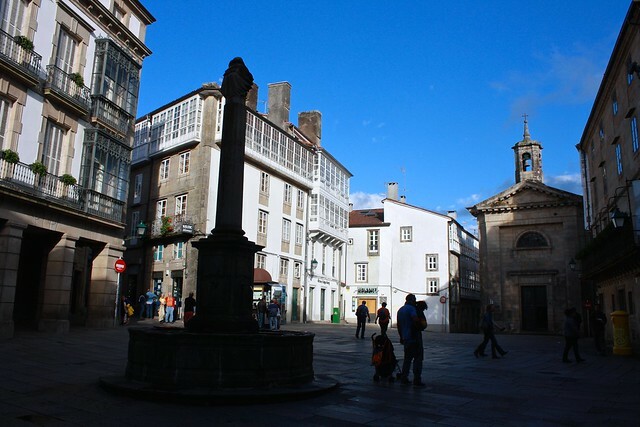 Safe to say, after visiting dozens of museums, churches, and parks, I’ve whittled down what I think are the ten essentials of any visit to the Galician capital. If you’ve got limited time, stick to the cathedral, the market, and octopus-eating, but if you can stick around for longer I hope you can try to hit up everything on this list. The cathedral we can see today is actually the third such church to occupy the purported burial ground of St. James. Constructed in the austere Romanesque style between 1075 and 1211, grand Gothic cloisters were later built to the south and an over-the-top remodeling left almost no corner untouched during the Baroque era. There’s a lot going on here, from façades and side-chapels to palaces and bell towers, so I’ve put together a guided tour that will take you all around the exterior of the cathedral and then in a similar circuit inside the church. I recommend reserving a spot on a guided tour of the cubiertas or cathedral rooftop. 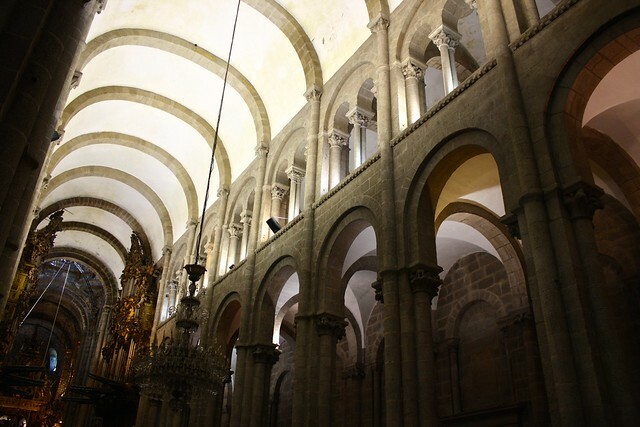 Not only is it a unique experience to explore a place normally off-limits in a cathedral, but it’s also an enlightening way to learn more about this building dripping in history. The views are pretty great, too! I don’t get to shop here as often as I would like, but Santiago’s food market is the best place to go for fresh fruits and veggies, still-chomping crabs, and local specialties like cheese, liqueurs, chorizo, and bread. Even if you’re not here to shop, it’s quite the experience to stroll through the eight granite halls and marvel at the variety of seafood that they catch off the coast as well as all the locally-grown produce. 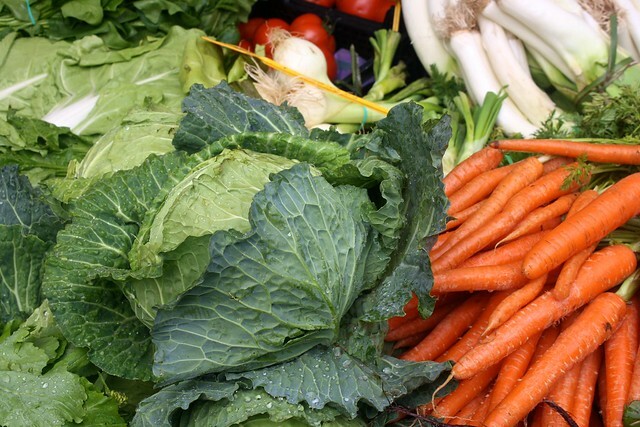 If you come on a sunny day, the market is a great place to buy picnic ingredients: you can pick up something to drink, a loaf of bread, a quarter of a wheel of cheese, some freshly-sliced cured ham, and a tray of juicy strawberries. 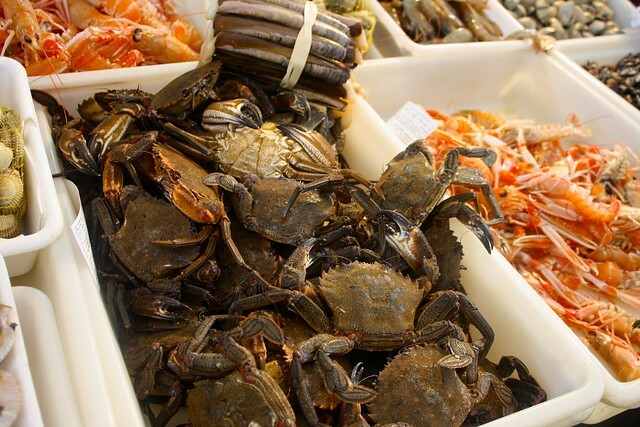 There’s even a restaurant that, for a small fee, will cook any seafood you buy in the market for you—which is a great service as chunky crabs and crazy barnacles can be kind of intimidating for landlubbers like yours truly! I love old towns just as much as the next guy, but there’s something magical about Santiago’s that makes it irresistible. Declared a World Heritage Site alongside the cathedral, this historic center once circled by medieval walls deserves as much attention as the 800-year-old church it grew up around. Its centuries-old houses are built from local granite, sometimes whitewashed save for the windows, sometimes letting the natural stone show, and often capped with glassed-in balconies called galerías. Two of the major streets in the southern half of the old town—Rúa do Vilar and Rúa Nova—are bounded on either side by soportales or arched, covered walkways that spring out from these homes and provide shelter from the rain. It’s fun to dash back and forth across the street from one side of the road to the other in an attempt to stay dry when it’s pouring rain. When the rain does inevitably let up in the evening, the granite streets glisten in the lamplight. Some of the sett stones used for paving the many rúas in Santiago are earthy and brown, others cold and gray. But wander around at night when the old town is reflected in this mirror, listen to the baritone of the cathedral’s bells calling out the hour, carefully avoid the puddles that hide in the middle of the road as you hop from tapa to tapa—and you’ll catch Santiago at its most dazzling. 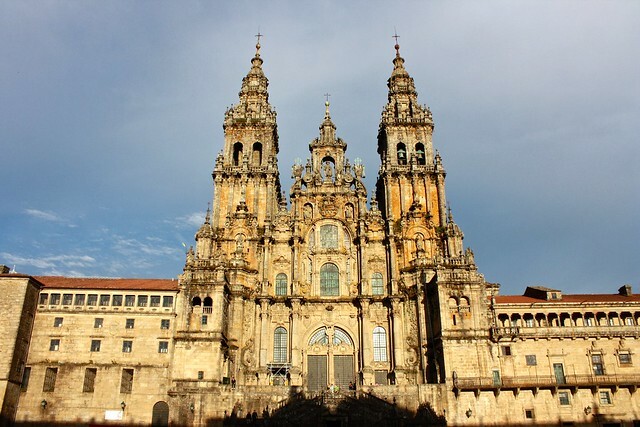 The Pilgrimages and Santiago Museum is a fresh, new museum that recently opened off to the side in the cozy Praza das Praterías. 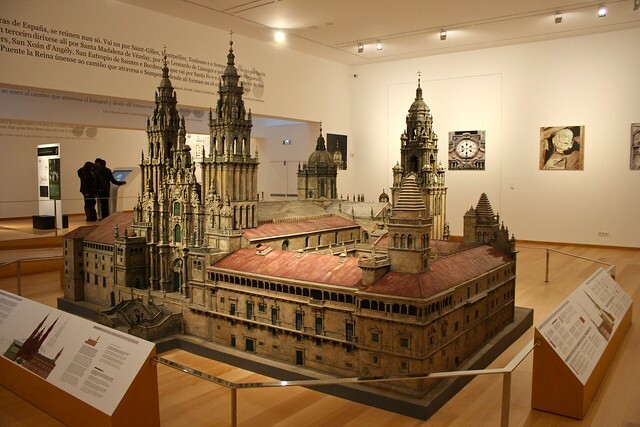 Visual learners like me will be happy to find a massive scale model of the cathedral on the ground floor, which helps to give you a better perspective of the whole cathedral complex, sometimes difficult from the ground and when scaffolding hides certain towers for restoration). The first floor also has a scale model of the old walled city as it would have appeared many centuries ago. As far as museums go, the Museum of the Galician People is a little dated, and artifact descriptions are only available in the Galician language. But it’s not hard to appreciate these memories from a pre-industrial age: traditional clothing, basket-weaving, pottery, instruments, masonry, house-building, farming, and weaving all make appearances. 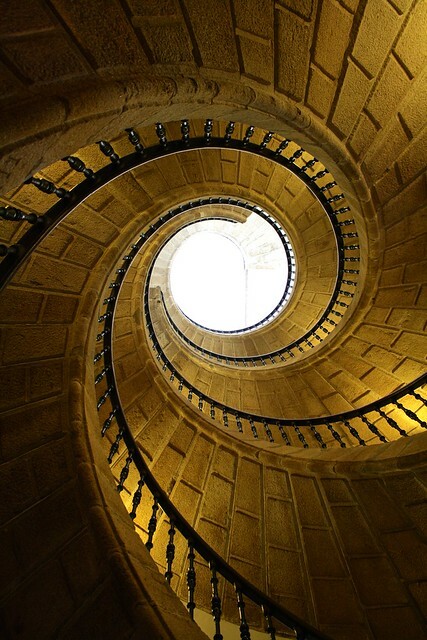 The museum itself is housed in a former Baroque monastery that (in true Baroque fashion) guards a dazzling architectural treasure: a triple staircase in which three separate stairs swirl upward in the same circular shaft. Pulpo á feira is the most emblematic of all Galician dishes: simply boiled octopus served garnished with olive oil, salt, and smoked paprika (and sometimes boiled potatoes). 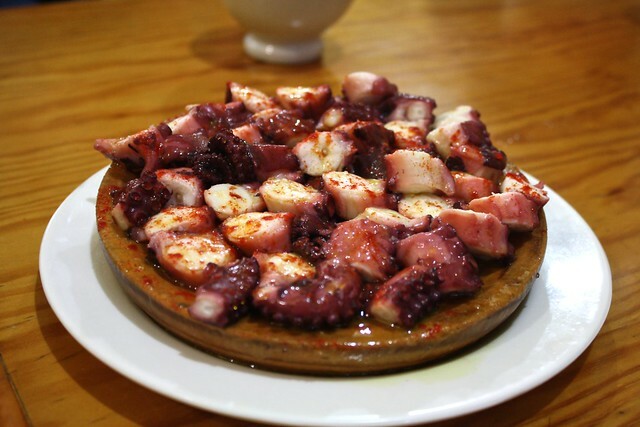 Not every restaurant in town serves good octopus, however; but if you’re interested in really experiencing this most emblematic of Galician dishes, head to Bodegón Os Concheiros Pulpería, just down the road from the bus station. They specialize in cooking this purple mollusk, which I have heard described as tasting like a cross between squid and chicken. Even if you don’t end up loving it, the octopus tentacles make for a great Instagram shot! The Spanish custom of getting a small plate of noms with your drink at a café/bar/restaurant dates back centuries, when you would receive a tapa or “lid” of bread, cheese, meat, etc. to place on top of your glass to keep flies away, which also prevented you from imbibing on an empty stomach. Many regions of Spain no longer give you a free tapa with your drink order (Catalunya, western Andalucía, and the Basque Country make you pay extra) but much of the country still holds to this historic tradition, Galicia being one of them. Santiago is no different, and no matter what you order—from a sweet glass of Albariño to a cup of Coca-Cola—you can expect to get a little something to munch on while you drink your beverage. 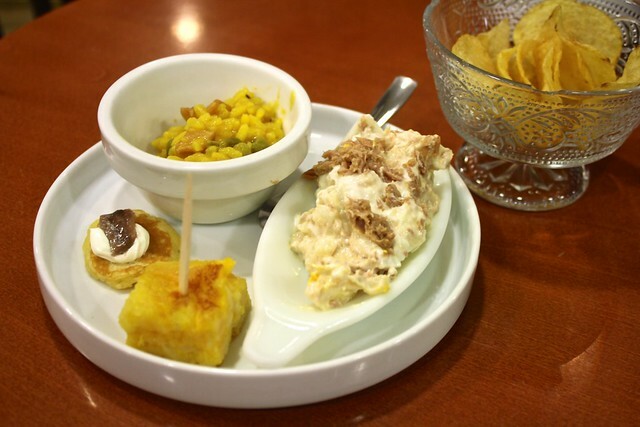 It can be as simple as in-house marinated olives with peanuts and Iberian cured ham to the amazing spread pictured above of paella, a cube of potato omelet, anchovy mini-pancake, and a dollop of “Russian” potato salad. 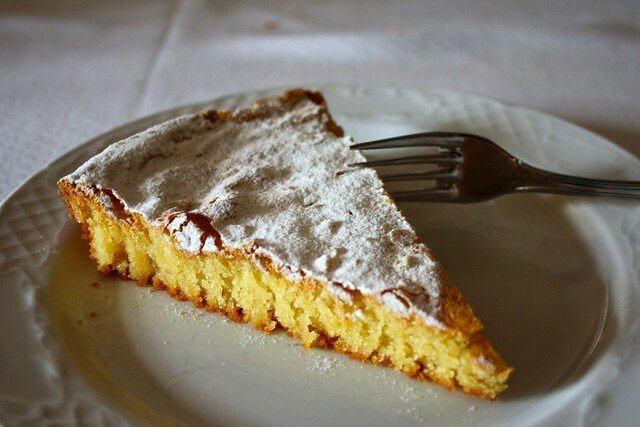 The perfect pair for your café con leche, tarta de Santiago is simply ground almonds, sugar, and eggs baked together and then sprinkled with powdered sugar over a reverse stencil of the Cross of St. James. As in many typical Spanish sweets, the fragrant flavor of the almonds combines nicely with sugar to create a subtle but delightful dessert. Many convents sell tarta de Santiago to the public, among other goodies, and the San Paio de Antealtares convent behind the cathedral even provides cakes to the King of Spain! 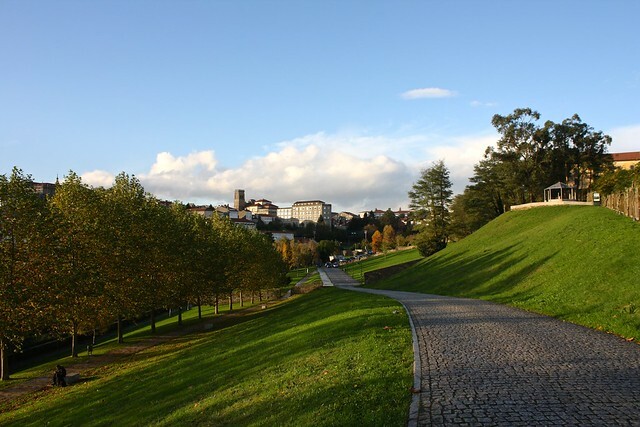 Santiago is blessed with an abundance of green spaces that encircle the city. To the west you’ve got the turn-of-the-century Alameda Park, a great place to go running or for an afternoon stroll, and to the east there’s Belvís Park, the perfect spot for a picnic on a sunny day. In springtime, the magnolias bloom along the riverside trail that follows the Sarela River, and in fall, Bonaval Park is the best place to see the leaves change color. Rugged, forested, and a little hilly, Galicia has in my opinion the most beautiful countryside in Spain. Living in Santiago de Compostela has given me a chance to get a taste of Galicia’s natural beauty by means of various hiking trails. 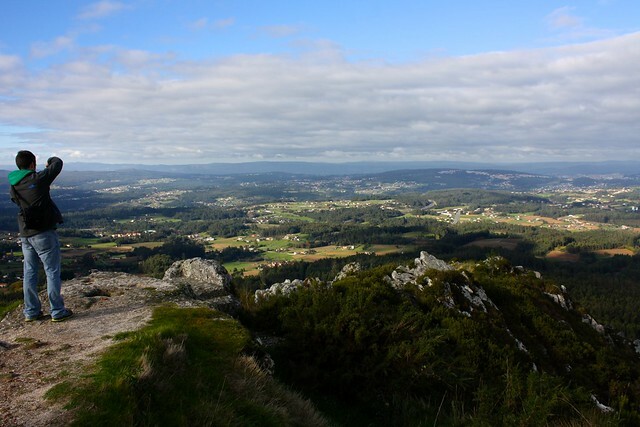 The hike I recommend to all newcomers and visitors is Monte Pedroso, a one-hour climb northwest of the old town with some really stunning panoramic views. Riding the bus half an hour south of town drops you off at the foothills of Pico Sacro, a craggy mountain where you can really experience wild, rural Galicia. And if you’ve got a day (or three) to spare, you can always start hiking west from the cathedral along the pilgrimage to Fisterra on the Atlantic coast. What would you most be interested in doing if you visited Santiago? Tell me below in the comments! For more pictures, check out my albums on Flickr.